A few days ago I posted a recipe for “Primal” Breakfast Casserole. It’s made with turnips and it was delicious! Although turnips have a slightly sweet flavor, they were a great substitute for potatoes in that dish. A few days later, Mark’s Daily Apple posted a recipe for Vegetable Latkes. 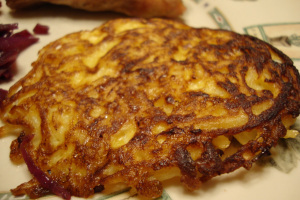 The Polish girl in me cannot resist a good potato pancake – preferably slathered in sour cream or applesauce. Not very low-carb, but so good… Anyway, I had a few leftover turnips and decided to try out this recipe. I was pleasantly surprised. Although not exactly like Grandma’s or The Polish Village Cafe’s, these are a very good replacement for low-carbers.